The transformations of methyl trifluoropyruvate pyrazin-2-ylimine in the cyclocondensation reactions with 2-aminothiazoline, amidines, aminocrotonitrile and aza-Diels—Alder reactions with cyanamines, leading to five- and six-membered trifluoromethyl-containing heterocycles, were studied. The possibility of using 4-(pyrazin-2-ylamino)-1-(prop-2-yn-1-yl)-4-(trifluoromethyl)-1H-imidazol-5(4H)-one, the product of methyl trifluoropyruvate pyrazin-2-ylimine cyclocondensation, for modification of phenothiazine by copper-catalyzed alkyne-azide 1,3-dipolar cycloaddition was shown. Russian Text © V.B. Sokolov, A.Yu. 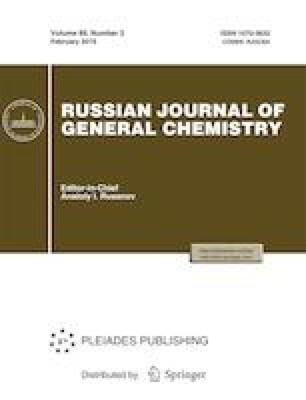 Aksinenko, 2019, published in Zhurnal Obshchei Khimii, 2019, Vol. 89, No. 2, pp. 324–328.